Technology is constantly offering us new ways to save energy and simplify our lives. It makes daily tasks easier, helps us organize, and keeps us all connected. However, one useful piece of technology that is rapidly growing in popularity and application is geofencing. By combining user location with mobile-device capabilities, property owners can save energy by programming thermostats, scheduling appliances to perform tasks, and controlling lights — based not on timing but on physical location. These features can even be used for garage door openers or smart locks, meaning no more forgetting to close or lock doors! But as this technology evolves, many property owners still wonder: what is a geofence, and how does geofencing work? 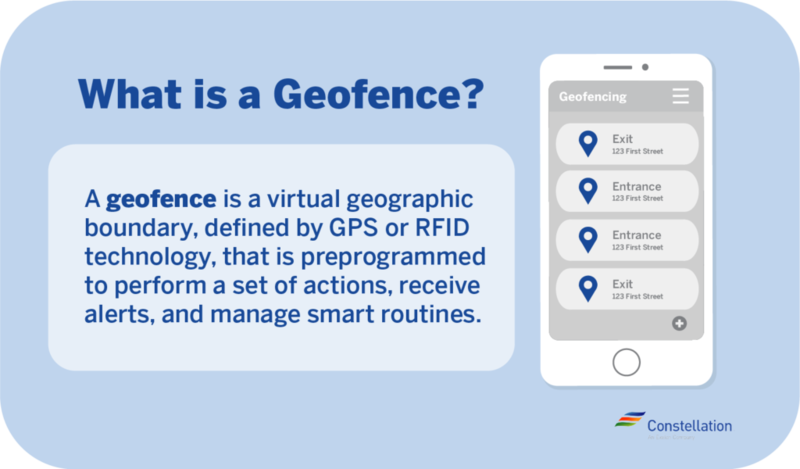 In simplest terms, a geofence is a virtual geographic boundary defined by global positioning system (GPS) or radio frequency identification (RFID) technology. When users cross this virtual boundary, a preprogrammed device can perform set actions, receive alerts and manage smart routines. This increasingly popular technology has both residential and commercial applications. Examples of commercial geofencing include social networking and marketing uses, as location-based services. People shopping in a favorite clothing store may opt in to the technology, and then when they enter the store and cross a virtual boundary, they will be alerted to sales, coupons and special deals. Geofencing also has residential uses. By defining a virtual boundary around your home, you can use a simple phone app to trigger reminders, control appliances, or raise or lower your home’s thermostat—all based on whether you’re currently within the geofenced area or outside it. There are many different ways to use geofencing, and all of these can make life easier and save energy. One of the best parts of this location-based technology is that it can start a series of actions whenever people enter a geofenced area as well as when they leave it. For additional energy savings, you can even integrate geofencing with smart security systems like Constellation Connect, which can easily link systems together in your home for easy access and control. With those capabilities in mind, here are some of the best ways you can implement geofencing around your home. Use geofencing to set up smart routines for controlling your devices. Once you’ve worked out exactly how to do geofencing, you’ll see that there are a number of ways to incorporate it into your smart routines that will make them even more efficient. Program thermostats to automatically adjust when you leave or arrive home. Maintaining the ideal temperature setting when you’re not at home or while you’re asleep can be tricky. Fortunately, geofences can be programmed to set thermostats to an energy-saving temperature when you leave for the day and then to automatically kick the heating or cooling on when you return. For improved energy savings, use geofencing with ENERGY STAR®️–certified smart thermostats for increased comfort and efficiency. Set lights to turn off, and never waste energy again. Forget about leaving lights on and wasting energy! You can use geofences to program your lights to turn off as you leave for the day, and to turn on when you return. It also adds an element of convenience, since you don’t need to worry about checking the house for lights left on. Thanks to geofencing, you also don’t have to constantly remind your kids to turn the lights off. Schedule smart appliances to perform tasks while you’re away. It’s easy to automate your home with geofencing. Appliances like robot vacuums can be set to turn on or off by using geofences. If you’re on the way out the door but need to start a load of laundry, geofencing can help. Washing machines can be set to start a load, dishwashers can be set to start a cycle and televisions can be set to shut off—all triggered by you leaving the geofenced area. Enhance your home protection with geofence-enabled security measures. For improved peace and mind, you can protect your home with geofence-enabled security devices. If you’re looking for easier access to all of your smart devices, consider pairing your personal devices with a smart security system like Constellation Connect. Use smart locks to automatically protect your property. Home protection is one of the most popular ways to use geofencing. Security devices like smart locks can be programmed to lock and unlock depending on who enters or leaves the location. Working late but worried about your dog? You can set your system to allow a neighbor in if your dog needs a walk when you’re not home. Geofence-integrated smart locks can also allow kids to come and go without you having to worry about them losing their keys—or about them leaving the door unlocked! Keep an eye on your home with geofence-enabled video surveillance. With geofencing, home video monitoring is a cinch. Surveillance cameras can be turned on when you’re away from home, and turned off when you return. For example, geofencing enabled-sensors may be used to detect motion and prevent break-ins. For added peace of mind, you can access your monitoring systems or control sensors remotely. Open and close garage doors without ever thinking or hitting a button. Don’t worry about leaving the house and forgetting to close your garage door! With geofencing, you can program your smart garage doors to open the moment you cross a virtual boundary, like a line across your driveway or down the street. Likewise, once you’re out of the designated area, the garage doors can be programmed to close to save energy and protecting your belongings. Use geofencing to keep track of your loved ones. If you take care of other people, you’re probably spending a lot of time making sure they’re safe. With geofencing, you can use virtual boundaries to keep them out of trouble. Keep your kids safe inside and outside the home. One of the most important benefits of this technology is its ability to help parents keep track of their kids and trust that they’re safe and nearby. Consider this: Your six-year-old is playing in the yard and suddenly wanders off. A geofencing app immediately triggers an alarm when your child moves outside of the safe zone, allowing you to respond immediately. With geofencing, you’re also able to set boundaries around dangerous areas around your home, helping to keep toddlers away from potential safety hazards (like swimming pools). Once you learn how to do geofencing, you can even activate home-security features to help with child safety, lost pets or aging parent care. Find your pets whenever they get lost. Leaving your faithful four-legged friend in the yard unattended can be worrying. What if he sees a squirrel across the street and decides to chase it? Geofences can be programmed to send you notifications right away—before Spot has a chance to get too far or get lost. Pro Tip! Never lose a pet again by using a smart collar! Geotracking can be used in microchips or collars to track down a lost pet so they can be brought back to safety as soon as possible. If you’ve ever set up a wireless fence for your pet, you have some idea what geofencing is. But how does geofencing work? 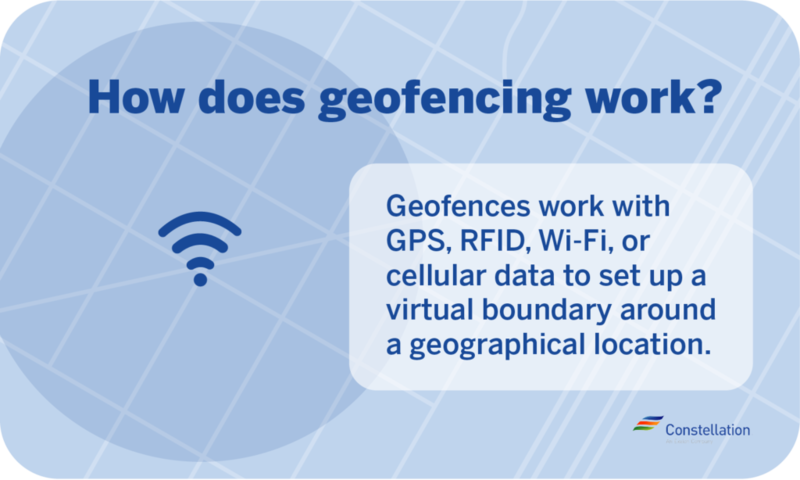 Geofences work with GPS, RFID, Wi-Fi or cellular data to set up a virtual boundary around a geographical location. When a mobile device outfitted with a geofencing app is used in a particular area, it interacts with and identifies information from GPS and Wi-Fi, and that triggers whatever actions the user has programmed it to perform in that location. When homeowners use geofencing with a home-automation hub, the technologies work together in an If This, Then That (or IFTTT) capacity. For example, businesses can use geofencing by targeting customers using IFTTT commands to automatically send out emails, sales alerts or special offers whenever those customers (for example) are in a certain area. If you can’t use Wi-Fi, you have other options with Bluetooth devices or beacons. These devices work best indoors or in smaller spaces, where you can keep mobile devices close to each other. For larger areas, Wi-Fi and cellular technology both work well. For commercial considerations, larger geofences are best for responding when customers enter the area, as they can send coupons or special deals through cell phone notifications, something beacons cannot do. You can set-up geofencing with many types of technology by using a variety of different mobile apps or smart assistants (or both) with location-based services. For maximum effectiveness and versatility, the best way to do geofencing is generally through a smart hub that coordinates home automation and connectivity with all your home devices. At first, installing geofencing may seem overwhelming, but using a home security system can help you automate your home, and provide you with unexpected and welcome ideas for increased safety, security and energy savings. With so many useful applications, you can expect to hear more about geofences and creative examples in the near future.